Tuning in, listening to, aligning with and following what your heart is calling you to can be a tricky thing in a world that seems to favour instant gratification, thrives on “overnight success” stories and drama. It requires a deep willingness of you to surrender into the unknown, into what you cannot see with your physical eyes, feel with your physical senses or even imagine with your human brain. Your hearts calling comes from the realm of Sophia – of She who birthed everything in love by extending the love that She is. The Magdalene Rising e-book is a powerful 34 page e-book guiding you deeper into revelation. 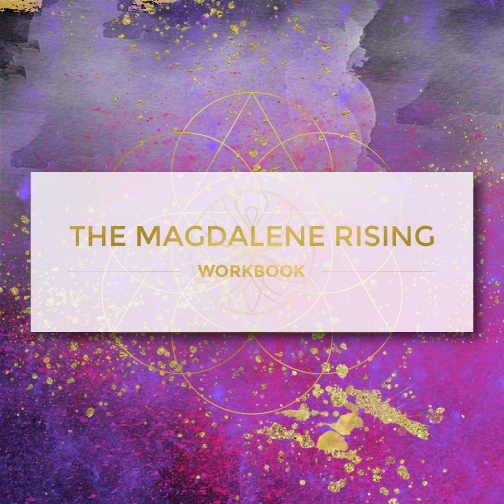 It contains in-depth descriptions of each of The Magdalene Precursors together with powerful prompts guiding you into deeper reflection, revelation and gnosis. “My whole life, I’ve carried the weight of “calling”- the intuitive knowing that I was hand selected by God, born for divine purpose. I’ve spent my whole life striving, chasing that calling, terrified of missing it, yet buckling under the weight of it. When I spoke of it, many dismissed me- or rolled their eye. Others called me prideful. Still I trusted… for years, without proof or validation. I hid in shame of being different. I shrank so not to be ridiculed or draw attention to myself. I feared being ostracized. Until I read Mariaestela’s The Magdalene Rising E-book & Blueprint. Immediately, I felt “found” – seen, celebrated and affirmed. What felt like a burden, suddenly felt like a blessing. I wasn’t alone. There were others like me. With deep knowing that comes only through personal experience, Mariaestela offered understanding, empathy and new insight to the seemingly unrelated – yet significant – events of my life and personal character. They were the arrows that connected my dots and led to divine revelation. I am no longer afraid, nor am I waiting for approval from the outside world. I’m stepping into my birthright and claiming the Truth of who I am and what I was made for. The Workbook is delivered straight to your inbox as soon as your payment has been completed. 34 beautiful pages filled with in-depth descriptions of the 28 Magdalene Precursors I have uncovered. 28 powerful journalling prompts for deep diving self reflection, revelation and ultimately healing.